Enhance your home’s exterior with a gorgeous, custom built wooden garage door. Our woodworkers are expert craftsmen dedicated to building beautiful, functional doors. As one of your home’s largest visual elements, shouldn’t your garage door be just as beautiful as the rest of your home? 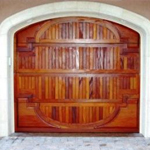 Katy Garage Door Repair’s designers work with you to design the wooden door. For example, your door can include inlays, windows, and unique hardware choices as well as beautiful wood finishes and stains. Imagine incorporating design elements that are repeated in other areas of the home or using an elegant design to make a dramatic visual impact. The possibilities are limitless! Once designed, the craftsmen get to work, crafting a durable garage door to your specifications. From there, the garage door will be delivered and installed by Katy Garage Door Repair’s professional installers. Additional options include a garage door opener, garage door remotes, and an external garage door keypad.